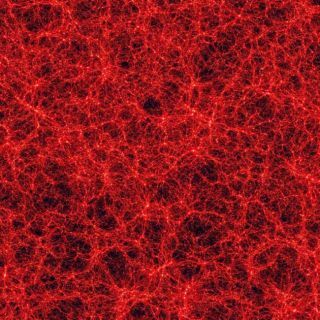 A supercomputer-produced cross-section of part of the universe shows galaxies as brighter dots along filaments of matter, with a sea of dark energy filling in between the galactic islands. New research suggests evidence of dark energy in our cosmic backyard, but theorists are still divided on explanations for the ever-increasing speed with which the universe is expanding. Until now, evidence for dark energy, a mysterious antigravity force apparently pushing galaxies outward at an accelerating pace, has only been found in the farthest reaches of the universe. But an international team of researchers has used computer models supported by observations from the Hubble Space Telescope to find hints of dark energy closer by. In the 1920's, astronomer Edwin Hubble showed that the universe was expanding and that galaxies were moving away from each other with speeds proportional to their distance by measuring the distances of other galaxies from the Earth. From this, scientists observed that the universe had been expanding since the Big Bang, the theoretical instant that the universe began with a giant rush of energy. It was assumed that this spreading out of our universe was occurring at a constant rate and that the tug of gravity among galaxies could possibly slow universe's expansion over time. But in the 1990's, scientists observed that exploding stars in very distant galaxies were dimmer than expected. This meant that those galaxies were farther than calculated. Not only is the universe expanding, but it is doing so at an ever-increasing pace, the data revealed. At a loss to explain this discovery, cosmologists concluded that an unexplained force, dubbed dark energy, was causing the acceleration. Dark energy is thought to work on grand scales. Locally, gravity holds an individual galaxy together and even binds clusters of galaxies. In 1997, Fabio Governato, of University of Washington and Italy's National Institute for Astrophysics, designed a computer model to simulate universal expansion from the Big Bang to the present. The simulated universes -- several scenarios -- were then compared with data of our actual one. The model, however, could not duplicate the patterns of expansion of the Local Group of galaxies, a huddle of more than 30 galaxies that includes our Milky Way. The simulation results predicted expansion speeds three to seven times faster than those detected by astronomers. It was only when Governato and his research team incorporated dark energy into the initial conditions of their simulation model and to the equation that regulates the expansion of the universe, that they were able to closely match the observed expansion speeds of galaxies nearby. "Adding dark energy changes the equation that describes the speed at which the universe expands with time and the growth of density perturbations," Governato told SPACE.com. "The observed motion was small, and we could not duplicate it without the presence of dark energy," Governato said. "When we added the dark energy, we got a perfect match." The scenario was presented last week and will be published in the Monthly Notices of the Royal Astronomical Society. The simulated universe is a sea of dark energy acting on billions of floating galactic islands, including the Milky Way and the other members of the local group, Governato and his colleagues say. "We studied the properties of galaxies close to the Milky Way instead of looking billions of light years away," Governato said. "It's like traveling from Seattle to Portland, Ore., rather than from Seattle to New York, to measure the Earth's curvature." But not everyone's convinced that the answer lies in the dark. "The hypothesis of dark energy is extremely fascinating," says physicist Antonio Riotto of Istituto Nazionale di Fisica Nucleare of Padova, Italy. But no theoretical model has yet satisfactorily explained its presence. Riotto and a team of theoretical physicists in the US and Canada say there's no need to add dark energy as a new ingredient to explain the increasing speed of universal expansion. "Our solution to the paradox posed by the accelerating universe relies on the so-called inflationary theory, born in 1981," Riotto proposed last week. According to this theory, the universe went through a period of exponential expansion in the moment immediately following the Big Bang. During this expansion, tiny ripples in space-time, much like those produced by a rock thrown in a pool, were produced. With a universe that is infinite, these ripples continue to stretch and grow with expansion and over time are causing cosmic acceleration. New York University physicist Georgi Dvali sees the answer in yet another theoretical phenomenon: leaking gravity. His hypothesis relies on string theory, which states that there are extra, hidden dimensions beyond the three directions and time. In such a case, gravitons, hypothetical elementary particles transmitting gravitational forces, may escape to other dimensions. This, Dvali explained earlier this year, would cause "leaks" in gravity over cosmic proportions, reducing gravitational pull at larger distances, altering the space-time continuum and effectively speeding up universal expansion. The answer appears as far away as the stars for now as theorists and observational astronomers grapple with one of the toughest questions on their agenda.